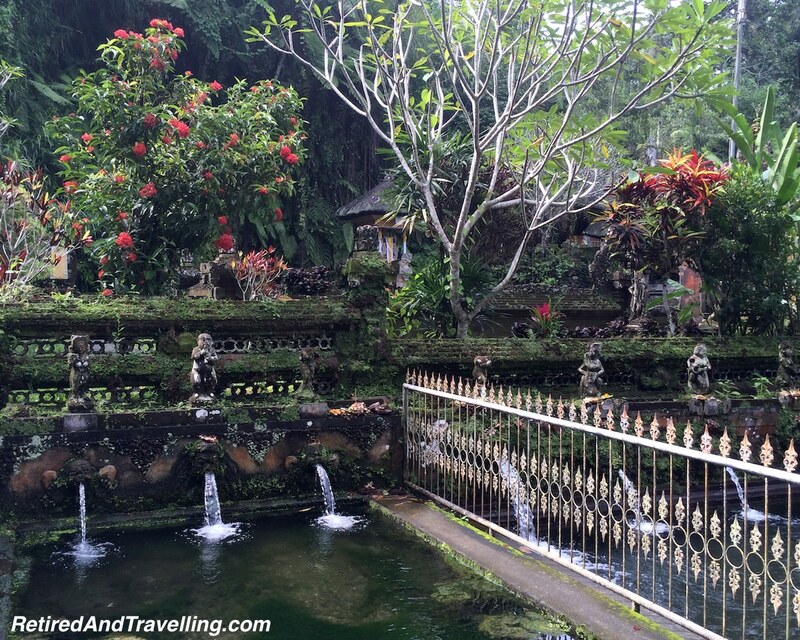 We were headed to visit the Ubud treasures for the day. With a list of stops in hand, we met our driver Joni in the lobby of our home base in Jimbaran Bay. While not very far in actual mileage, this would be a long travel day as we headed north from the Uluwatu peninsula to the interior of Bali. It was made even longer when Joni decided he was moving directly from destination to destination without a bathroom, water or coffee stop. 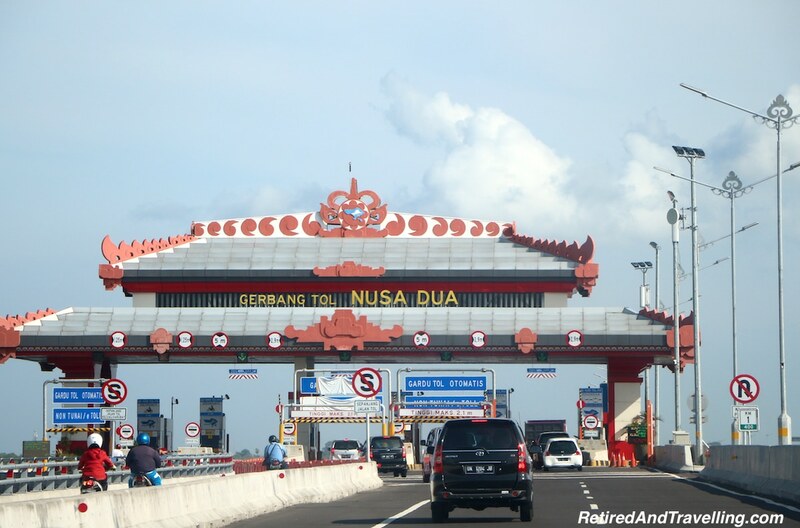 From Jimbaran Bay, Joni decided to avoid the traffic around the airport route and cut across the peninsula towards Nusa Dua and then took the paid toll road. With little traffic we actually managed to almost hit the 80km/hr speed limit for the short stretch (less than 8 kms) on the toll road. We headed up the east side of the island, past the busy harbour and through Sunur. We could see a cruise ship in dock, confirming that you could indeed spend just one day in Bali. But if you are there for just one day, you would need to be careful how much you planned to do with travel times around the island being so long due to traffic congestion. David had his camera lens plastered to the window to catch the sites as we drove by. We continued to see individual temples of worship at houses along the way. The major intersections typically had large and ornate statues in the centre. Several times we saw long artistic displays on the roadside. 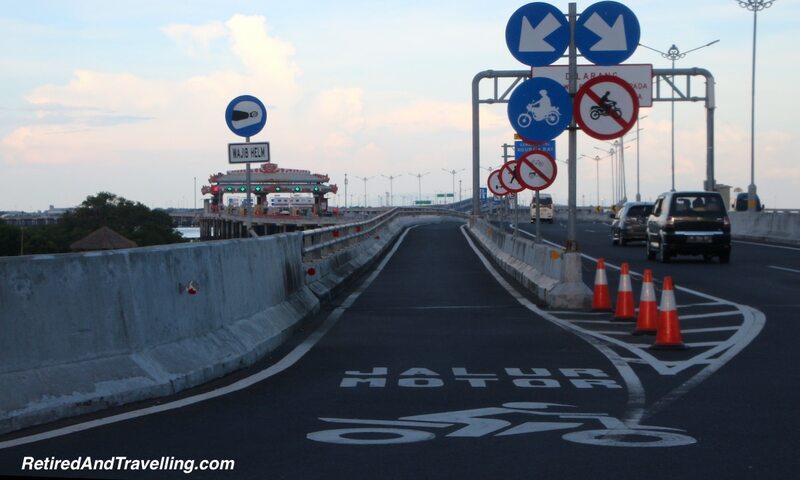 We saw the faces of Bali everywhere we drove. Stopping at a truly authentic Balinese local market, we alighted from Joni’s car to the heat of the day, some wonderful smells, amazing colours and total confusion! There were “stalls” everywhere selling everything the locals would need; food, drink, household items, crafts and our favourite colourful textiles. After a short bathroom break (0.20 cents for NO toilet paper and a squat hole! ), David was immediately recognized as a “rich” tourist who was advised NOT to buy this nearby poor fabric. 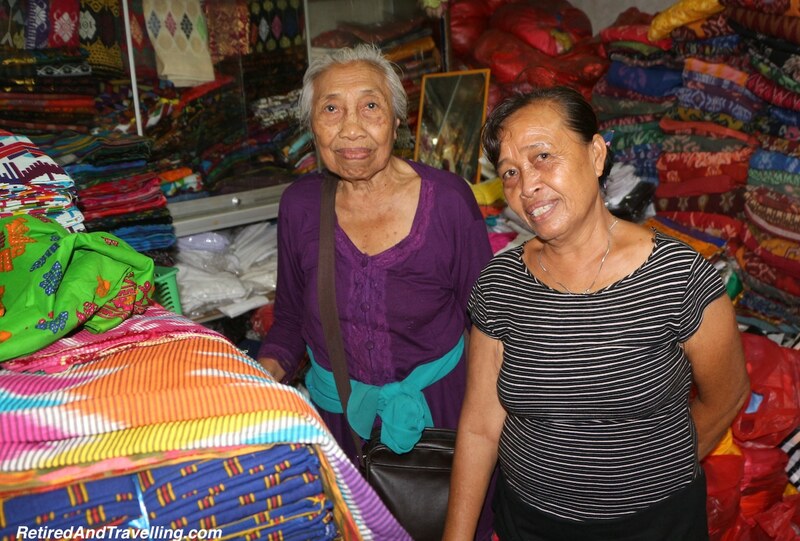 The persistent saleswoman had good enough english to insist we go with her to buy sarongs from her Mama that were well made by her father and coloured by her mother. Walking for a short distance, then up some stairs, we were ‘expertly’ manipulated into the one exit stall, soon blocked by smiling Mama. A truly great deal was bargained – she started at 650,000 IDR and we would ONLY pay 100,000 IDR. So we paid 100,000 IDR (about $10CDN) and walked away knowing that was a good price and that the two ladies were happy that they probably made too much money off the rich tourists! Joni noted that along our way we would go through various towns known for different types of handicrafts, whether it was wood carving or silver and gold jewellery. We were not really on this trip to shop but we did ask to stop at the Batik market. Hoping to get a display of how they made Batik cloth, I was a bit disappointed to find mostly a large commercial shop and a very small number of people doing batik-like paintings on t-shirts or shorts. I really did not need to have “Happy Honeymoon Bali” in a monochromatic picture on my clothing despite how artistic the design looked. While the wax may have stood up for a few days, I was sure that it would not last a first washing. 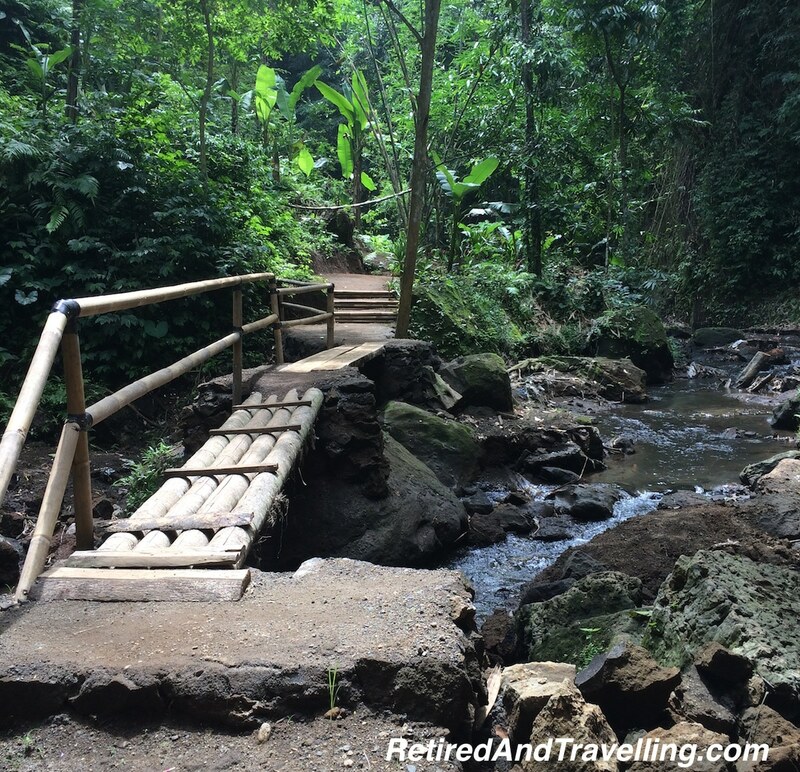 We headed off the beaten path in search of the secret waterfall, one of the Ubud treasures that our son Nick had found when he stayed in the Ubud area. Joni had never been to this location so we stopped several times to ask the locals for directions to the waterfall at Tibumana. 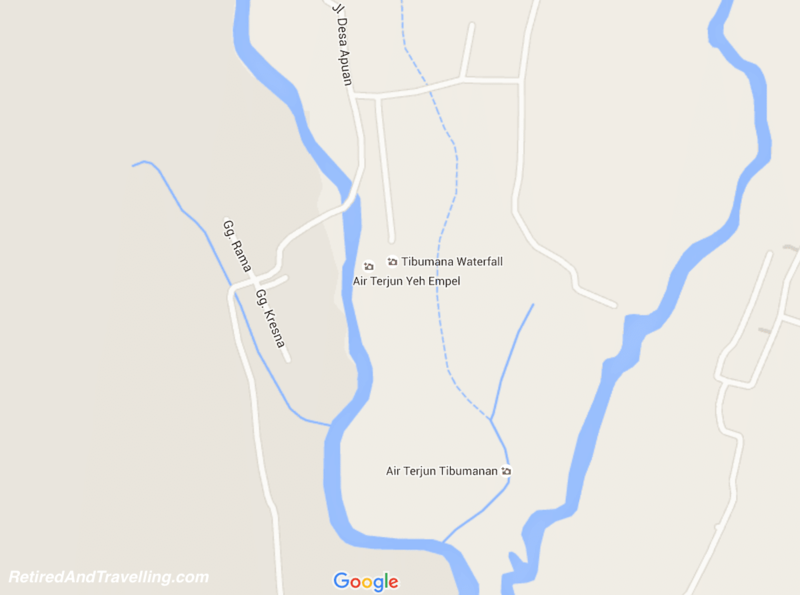 I could see it easily on my off-line MapsToGo app and was able to confirm that we were going in the right direction once we left the village of Gianyar. The Tibumana waterfall was situated beside the Melukat Temple. If you are searching for this waterfall, it may be easier if you ask for the temple. Joni was a bit concerned about whether the road would be ok for the car (since Nick had visited with his trusty scooter), but the road was narrow with two lanes until you made the final turn. Leaving the main road, a single lane path led to a small parking lot with a little booth for admission. It seems that even in places with little tourists, someone finds a way to collect a fee. The walking path led you through the forest to a series of steps leading down to the waterfall. When we finally hit the bottom (about 150 steps), there was a small thatched cabana, a rock beach and the waterfall tumbling into the lagoon. The inner tubes at the site could be used to float around the lagoon. The water was cool and refreshing. David and Joni took delight in swimming directly through the waterfall, David commenting that it felt a little like waterboarding might. We spent some time enjoying the water. While we were there, only one small family joined us at the spot. We saw a few young boys at the temple site but overall this secret waterfall was quiet and secluded and one of the genuine Ubud treasures. 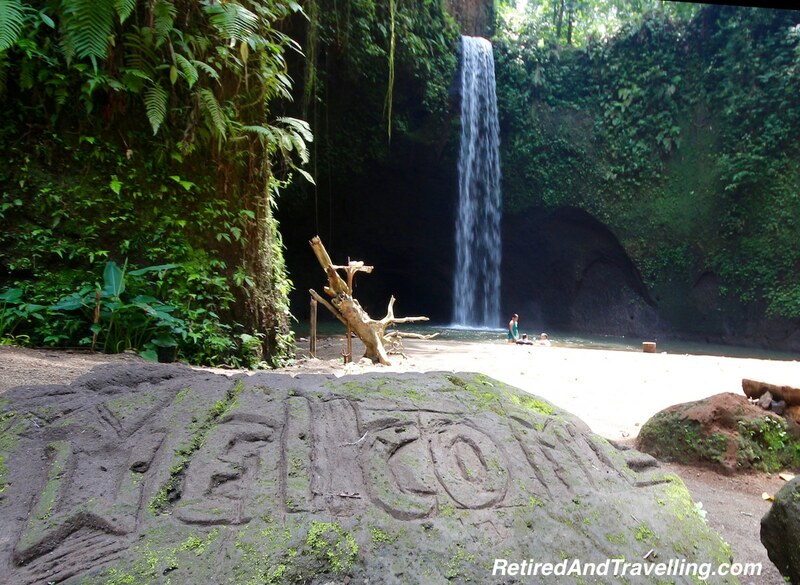 Joni noted that the larger Tegenungan Waterfall where most tourists went would not have given us this private and tranquil experience. He would note this location for visitors he brought to the area that wanted a little more local flavour. On the way back up, David and Joni took the second path that went back down to see the Melukat Temple. 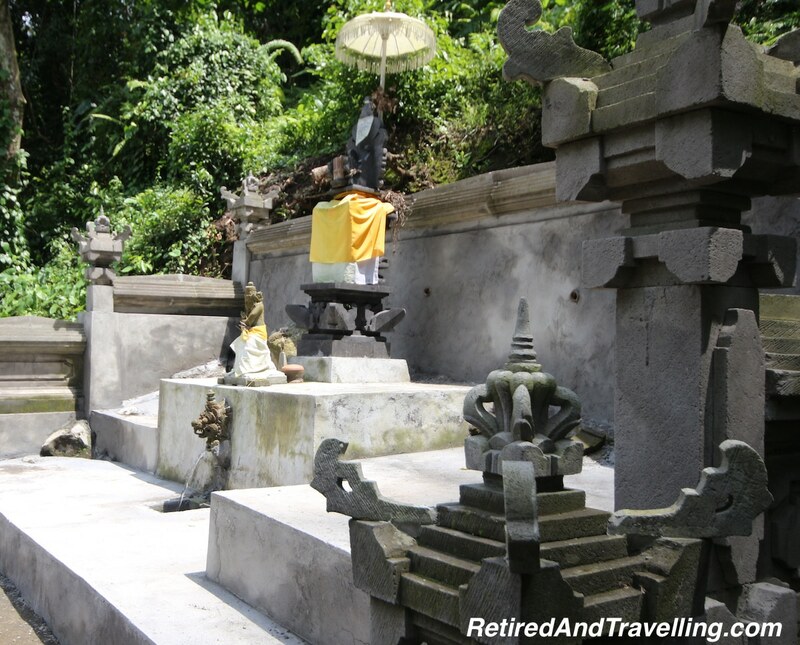 This was a local worship spot and like many of the temples in Bali, the source of holy water. I just kept plodding back up the steps to the car. I would see this temple through David’s camera lens! 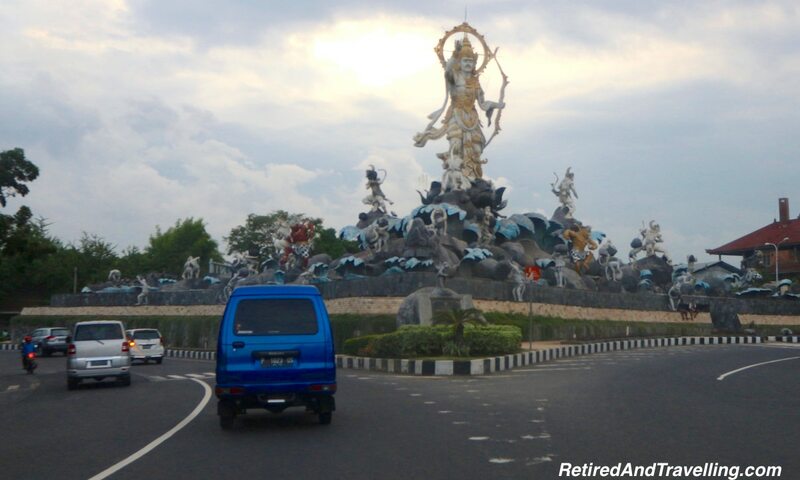 Getting back in the car, it was easy for Joni to head back to his pre-planned route closer to Ubud. The waterfall detour had taken us a few hours and we were not going to get a break until we finally stopped for lunch at 2pm. 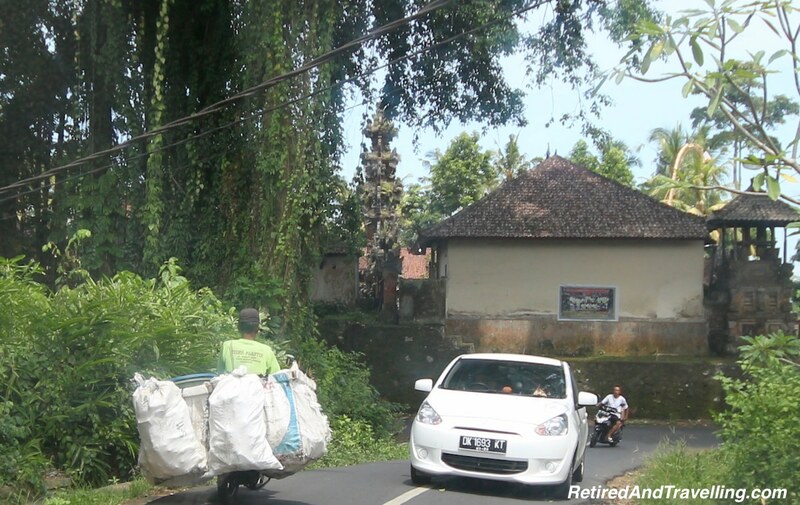 As we neared Ubud, the traffic came to a halt and we could see police checking each vehicle. I am not sure what the police actually checked when Joni rolled up but he paid his 20,000IDR (about $2CND) and off we went. Johnny noted that we might be stopped many times more as we drove around but this turned out to be our only “traffic” stop. I am not sure what the fee would be if you were not a local but be prepared to be stopped and to pay. Joni had his favourite spot picked out for lunch. We arrived at d’Alas and headed deep into the trees and started down a path. I was not sure where we were going for lunch as we moved further into the trees and down the hill. When we finally stopped we were on a small terrace overlooking the rainforested hills with rice terraces off in the distance. We managed to get seated under cover before the rain started to pound on the thatched roof. The waitresses moved up and down the hill with their umbrellas as they brought us a traditional delicious Balinese meal. It was a great scenic view. By the time we had finished lunch, the rain had passed and we could tread carefully back up the hill. Our second stop with a view was the coffee factory store Bali Pulina owned by the same people as the restaurant. Even though we had no complaints about the places we stopped, we wondered what incentive Joni got for bringing us to the stops. We again headed deep into the trees along the path for the coffee tour. 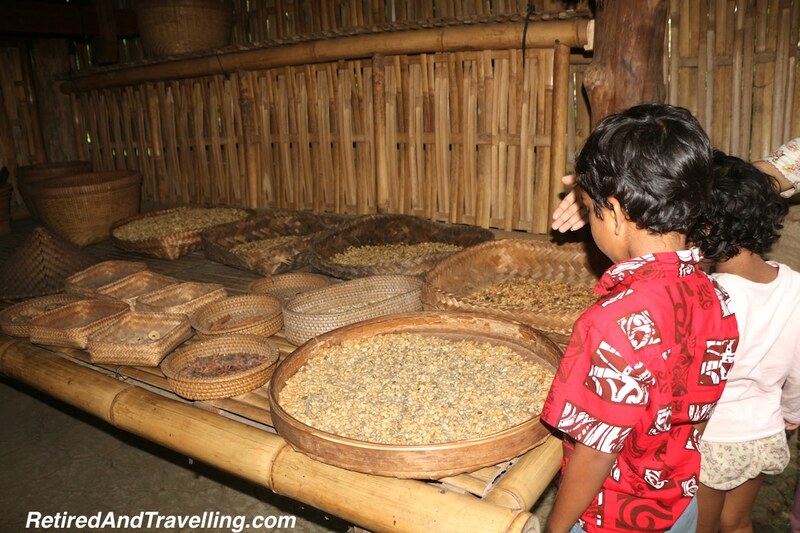 We saw the luwaks in the cage, the likely source for the Kopi Luwak coffee you could purchase. We were so glad we had seen the luwaks playing out in the open on our day trip to Canggu. We saw the coffee plants along the path, a display of coffee beans and a roaster. 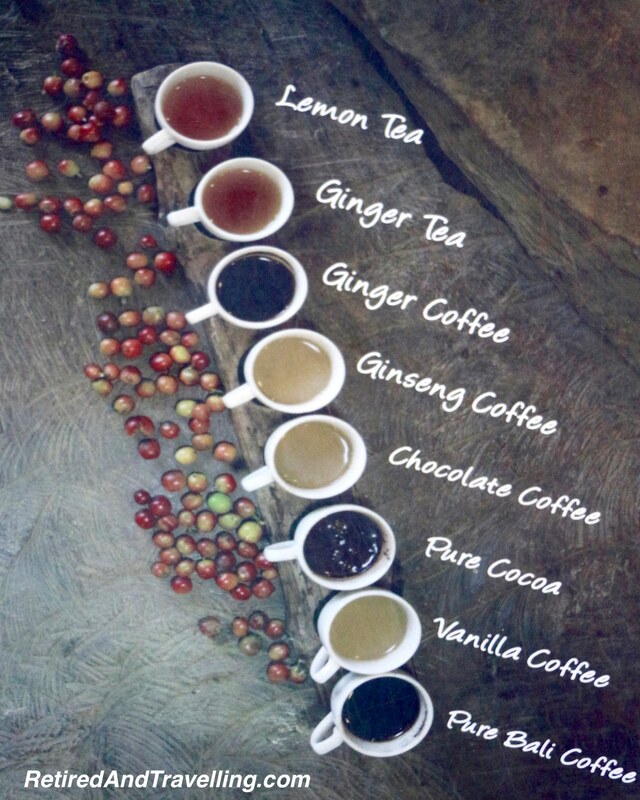 Moving on, we stopped for a taste test of a variety of teas and coffees. We found nothing that would tempt us to buy for home or for a souvenir. Coffee would not be one of the Ubud treasures we would take home for friends. 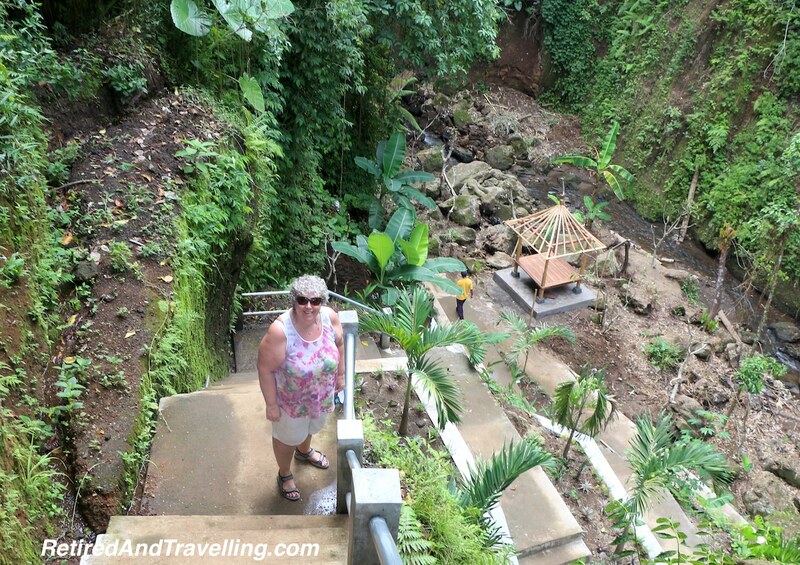 If you walked down to the bottom you could go out on a platform and get a great view of the rainforest deep in the valley and the rice terraces. 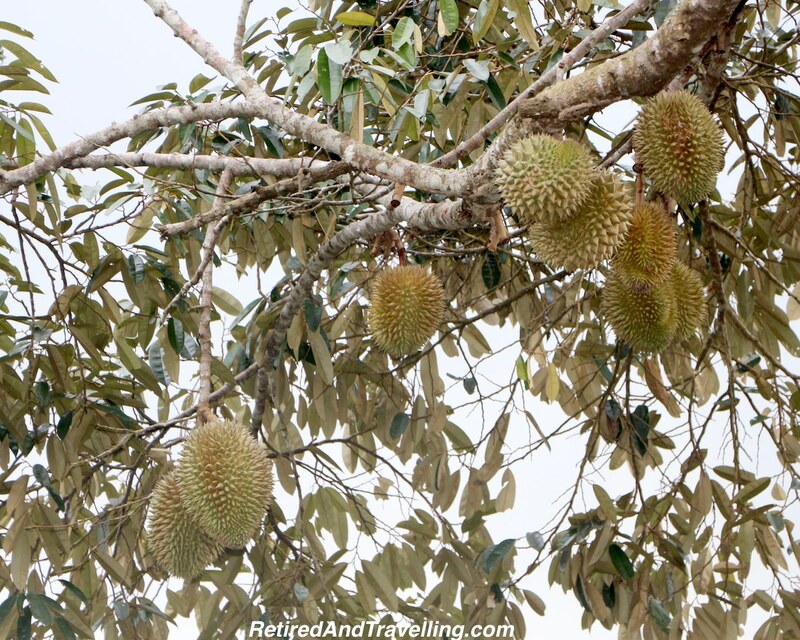 The viewing spot was right under a durian tree (the famed “stinky fruit”) and I took my pictures quickly, not wanting the spiky durian fruit to drop on my head. 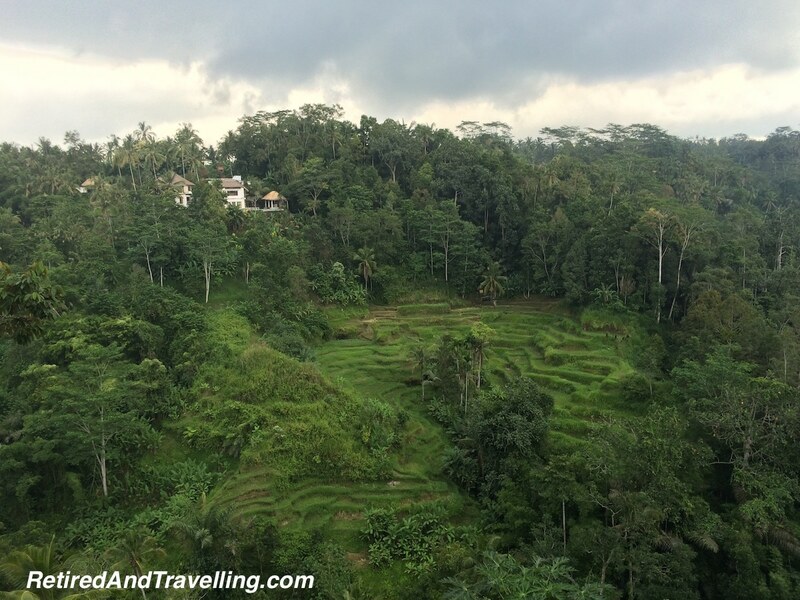 We found the hillside views to be one of the Ubud treasures. I dragged myself back up the hill, knowing that in the very hilly Ubud, every stop would mean a lot of stairs down and up. 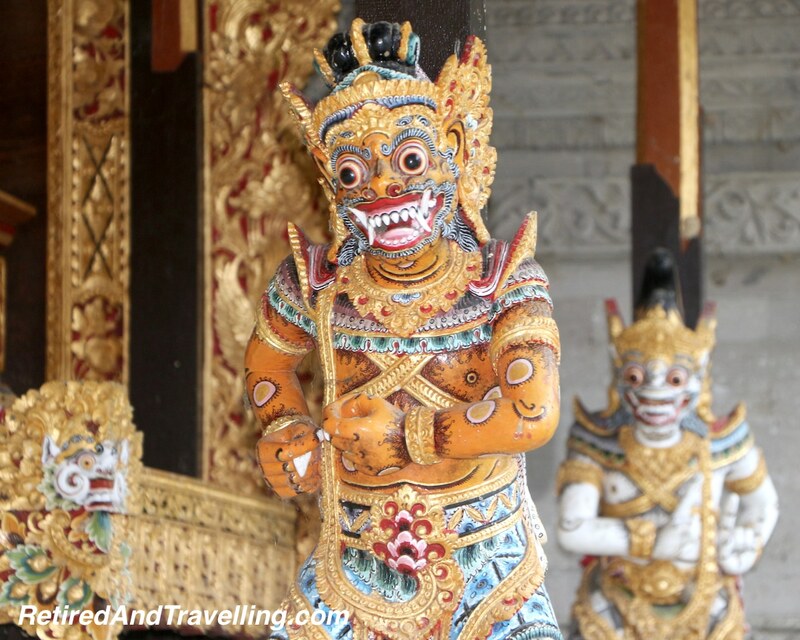 There are several temples that you can tour when you visit Ubud. 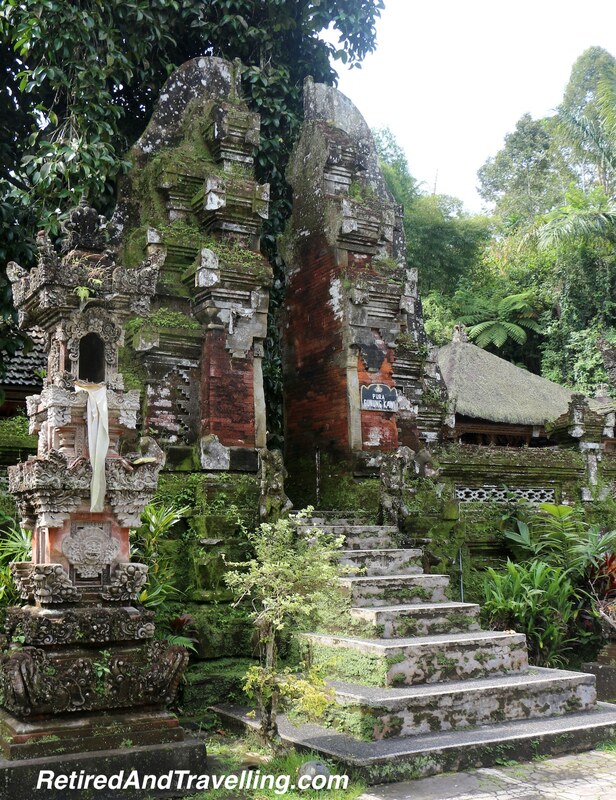 Joni’s Ubud tour recommendations included a visit to the Gunung Kawi Sebatu Temple. This would add yet another temple on our Bali visit. The Gunung Kawi Sebatu temple seemed to be a less popular tourist spot which allowed us to visit without jostling crowds. We found the temple to be spread out and in quite good shape. This temple was yet another source of holy water and the water spouts proved to be a picture magnet for the tourists. 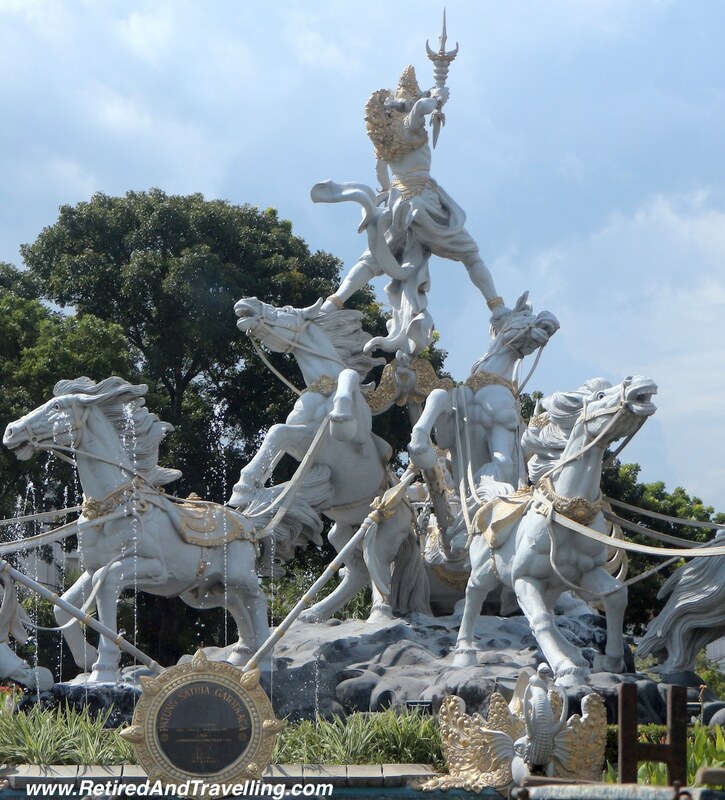 We wandered around the large site enjoying the great artistic and religious displays. 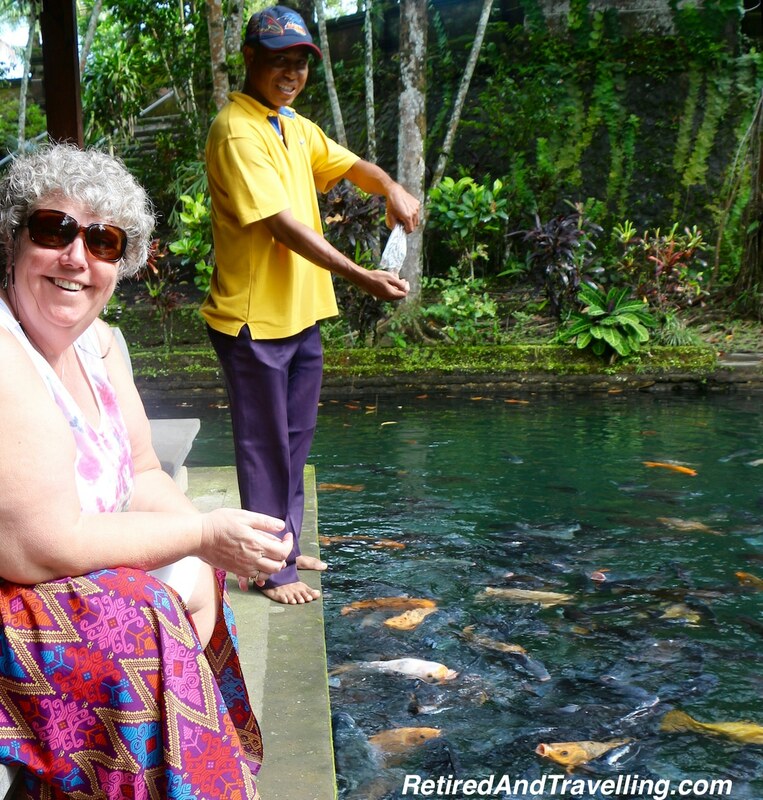 Joni had made a great choice of Ubud treasures for us to visit. 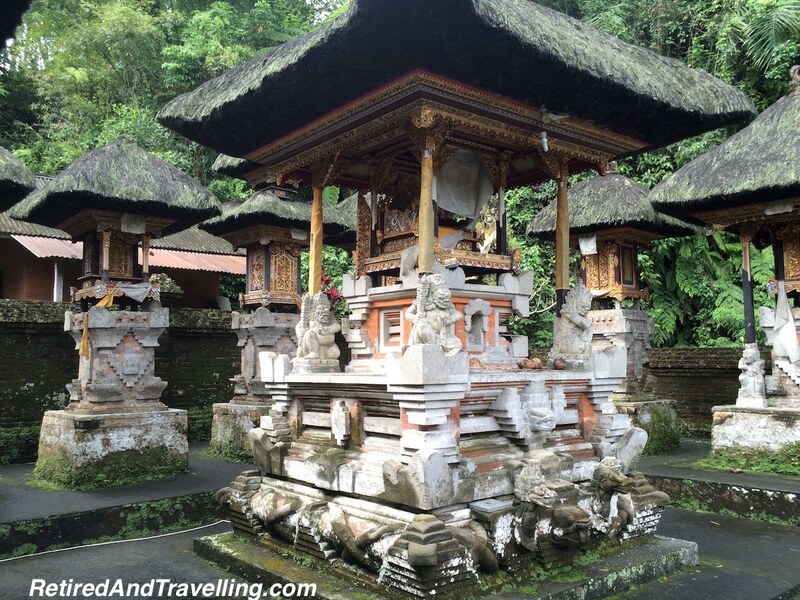 This was a great addition to the collection of Bali temples that we would visit. 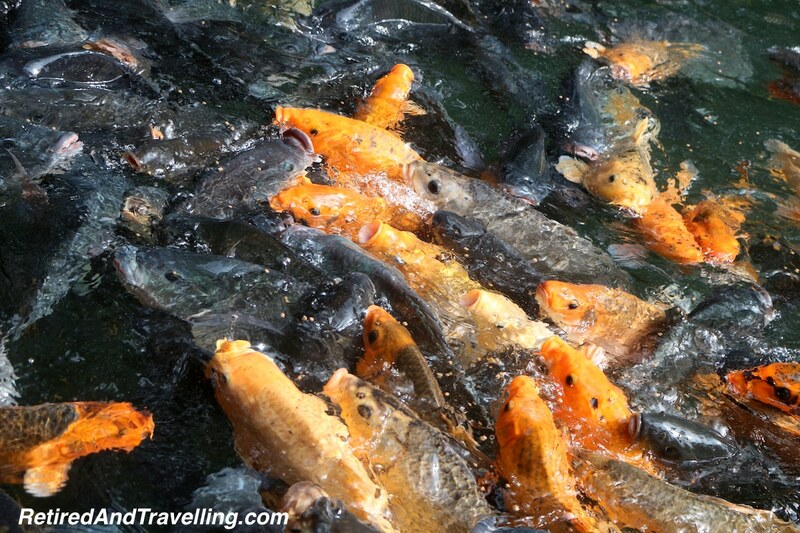 While Joni and I waited for David to photo every niche of the temple, Joni and I fed the koi fish in the big pond. It was clear that these fish got fed a lot. The bigger fish were huge and aggressive. Several times we threw food further out into the pond, hoping that the smaller fish might actually get something to eat. 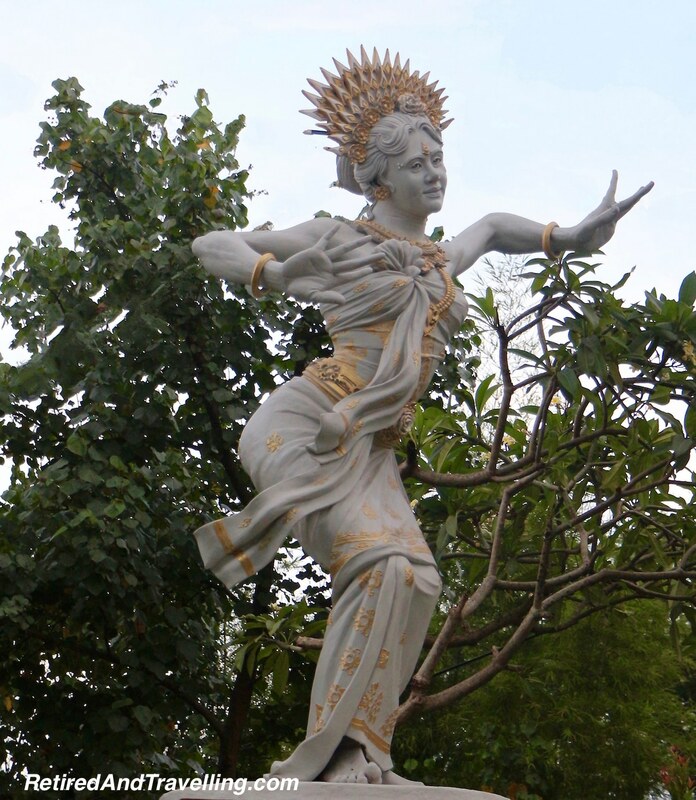 We had one more of the Ubud treasures to see before we could point Joni in the direction of home. While we had caught some glimpses of rice terraces off in the distance on our earlier stops, I wanted to see the broad set of rice terraces in the centre of Ubud. As we approached the busy street overlooking the Tegalalang rice terraces, Joni again had to pay, this time for the right to park (another 10,000IDR or $1CDN). This didn’t get you a parking spot, so Joni let us hop out and said he would wait where he finally found a parking spot. Along the street there were various places where you could take the stairs down to viewing spots for the rice terraces. You needed to fight your way through young children trying to sell postcards for “books for their school”. Having seen such groups of children being mustered to sell as we travelled around Bali, we knew to pass them by. The viewing terraces were generally filled with tourists but you could wander a bit to get a better view. 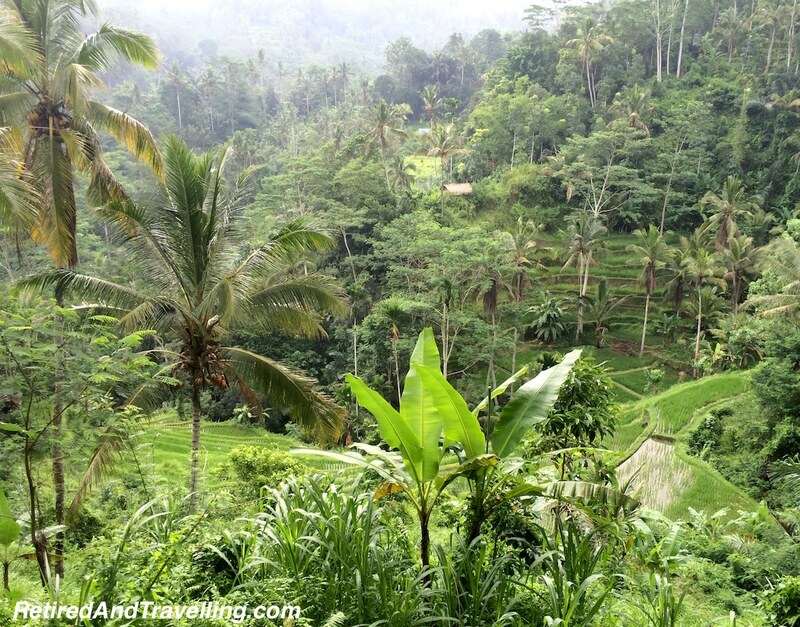 The view of the rice terraces are one of the Ubud treasures and proved to be all that I had hoped for. It would only have been better had the sky not still been threatening more rain. 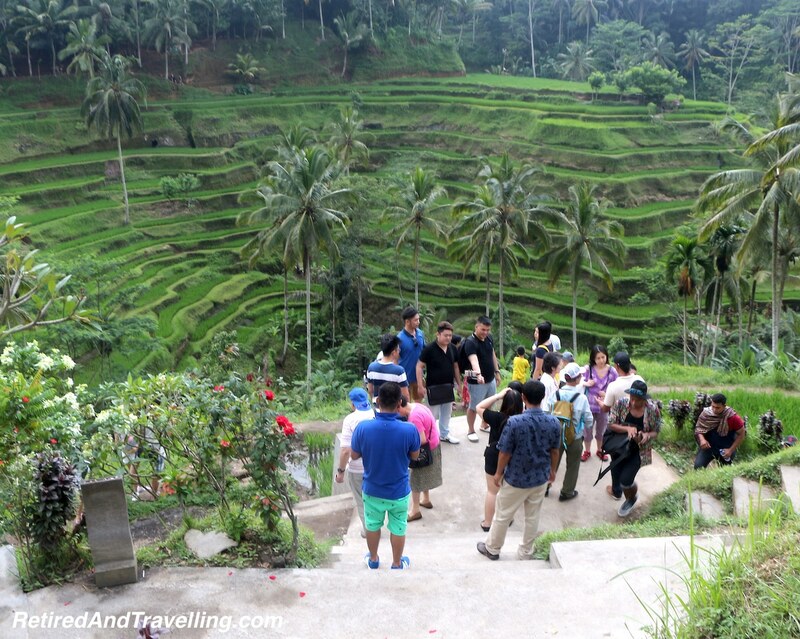 We moved about from spot to spot capturing the very interesting views of the rice terraces. 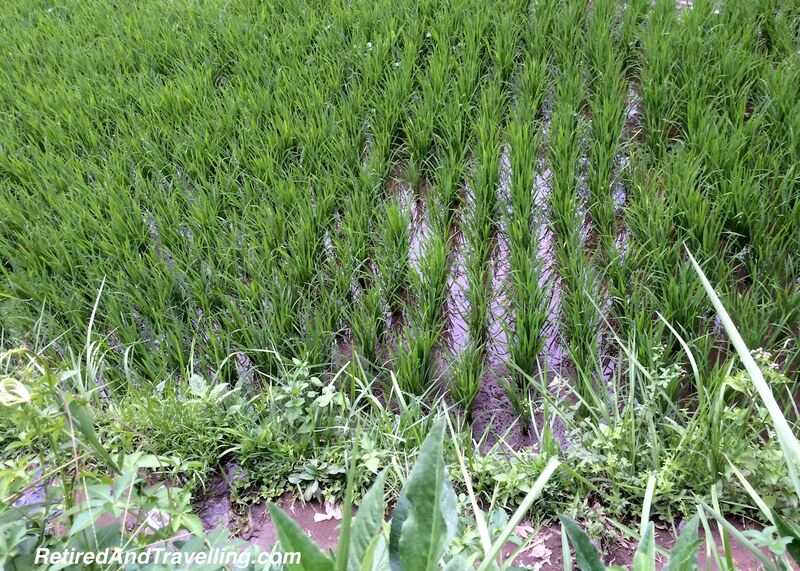 If you got close, you could see the young rice plants growing in the water. 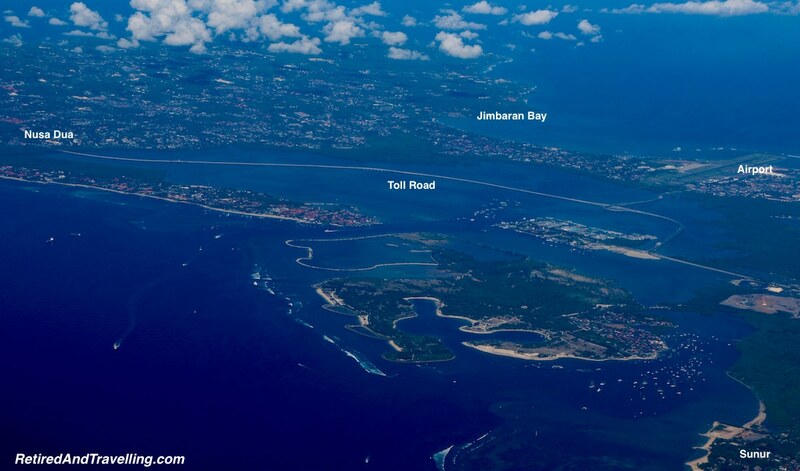 It was a long 2 hour drive back to our base in Jimbaran Bay as we retraced our route. It was a great day getting a taste test of the Ubud treasures and a highlight of our week in Bali. 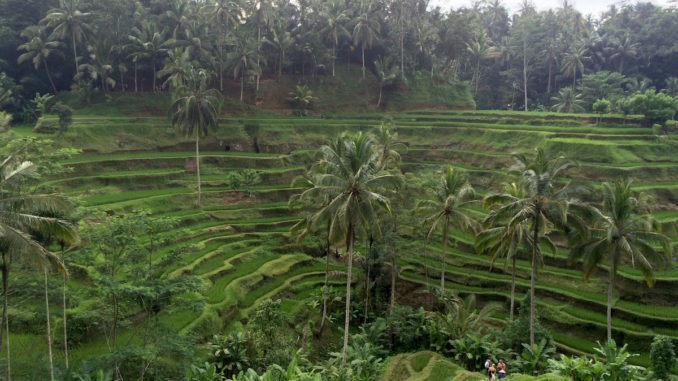 Ubud is a very popular tourist destination. We had intentionally tried to pick spots in the Ubud area that were a little off the beaten path and less thronged with tourists. 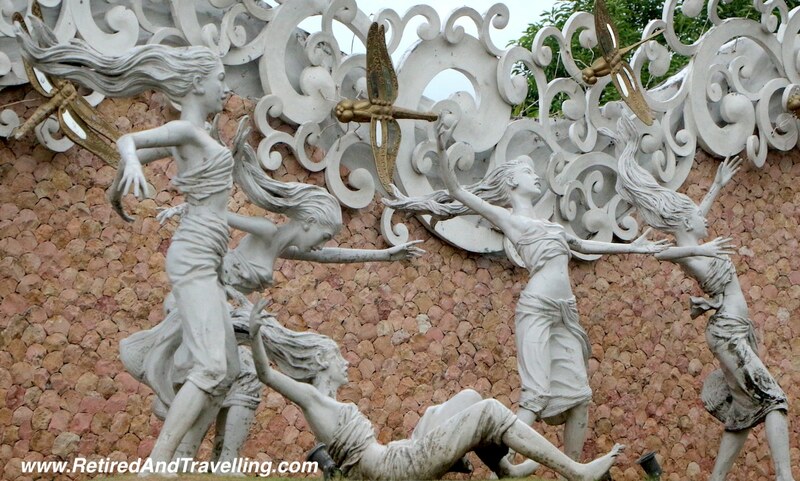 Next time we visited Bali, it would be great to plan to stay in this area and explore more. 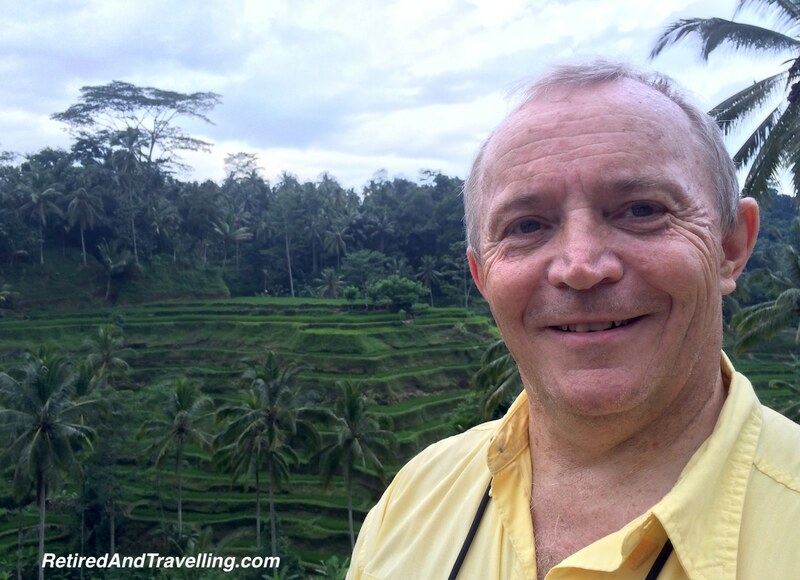 Our son Nick certainly found lots to keep him engaged while he was in Ubud. He even did a local cooking class! 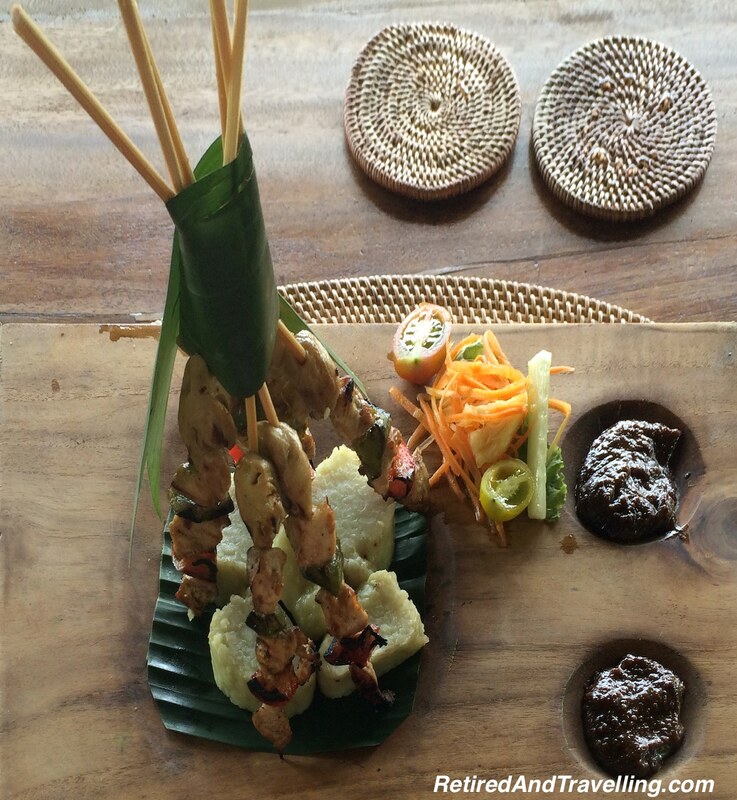 What was your favourite of the Ubud treasures? 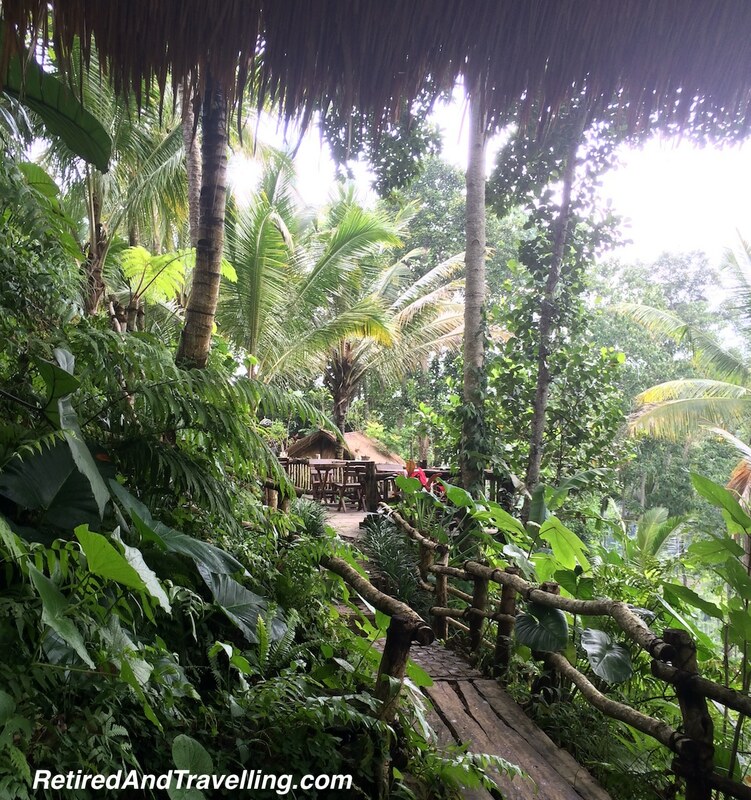 Did you stay in Ubud or just visit for a day trip? Would you recommend a longer stay?